It is now easier than ever to create electronic music and there are many programs which are available for both the Mac and PC which can provide high-quality tracks. However, a lot of these tracks lack character and this is because everyone chooses to use the easiest methods which usually involve the same set of presets and plug-ins. The new Volca devices offer an affordable way in which to create character and this is because they are being recorded as an external device, through a cable and into other recording devices, all of which creates character in themselves. So how can you create character with the Volca in a selection of different ways that you would not be able to do with a software plug-in or preset? 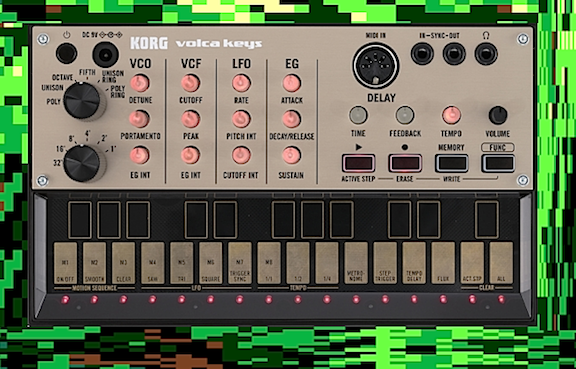 As soon as you begin recording the Korg Volca keys you will begin creating character as there will be a small amount of noise from the line input that you use. This will vary slightly depending on the type of cable that use and may create more noise depending on how cheap the cable is. Many individuals now love a little bit of noise to add character. However, if there is too much noise then you can use a gate plug-in on your software synthesizer, in order to cancel out this noise. You can also create interesting atmospheres by recording the Volca out of a speaker and then through a microphone or similar recording device, so as to catch the ambience of the room. This will create a reverb from the space, depending on the size of the room. If you record the Volca out of the speaker into a microphone in a small bathroom, the reverb will be very small. However, if you can gain access to a church or a large hall and record the Vulca in that space, then the reverb will be very large and this will create a very dynamic and individual sound. The format that you choose to record your Volca on two will greatly affect the character of the sound. A tape player can be used to record the vulca and will create a lo-fi Analog sound that can be very unique and stylistic. You can then re-record the recording that was made on the tape back into the computer and then use it to sequence in a software program such as Logic or Ableton, or save it in a sample pack for sequencing at a later date. If you want to stand out from the crowd then it is important that you are individual in some way and finding techniques such as these in which to record and sequence your sounds will mean that you create a unique result that is personal.